A versatile overdrive pedal for warm blues to rich singing drive! 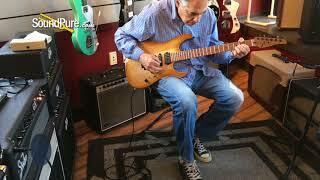 The Suhr Shiba is a fantastic addition to any rig. 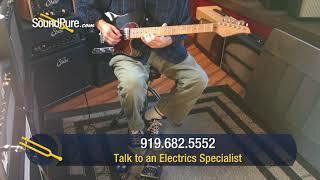 It can add the much needed "2nd Channel" to your clean amp. What it also does it compliment a higher gain amp with added singing overtones that don't mush out. This is a serious tone tool that you should have in your rig! Our RELOADED™ series is the result of countless hours of listening, testing, and modifying our original distortion and overdrive circuits. Armed with a wide variety of guitars, amplifiers, and pickups, and using our award winning Riot and Shiba pedals as the foundation, we developed Reloaded to deliver a unique tonal palette, while retaining the pedigree of the originals, as well as incorporating all of our customer’s most requested features. In July of 2009, we shipped our very first Shiba Drive pedal. Shiba was designed to provide players with a variety of fat rhythm and warm singing lead tones. The Shiba Drive gained great popularity among players seeking an overdrive pedal that could be used in conjunction with their amplifier’s clean or overdrive channels for added flexibility. Shiba Drive Reloaded is the result of countless hours of listening, testing, and tweaking our original overdrive circuit to create a pedal that is more amp-like, has a tighter low-end, focused mids, and features more gain (50% more than our original Shiba). Shiba Reloaded is the ideal choice for players seeking classic Blues, Jazz, and Rock style tones. In our continuing effort to provide the very best tools for the serious musicians, we turned our attention to other links in the electric guitar signal chain. Having covered guitars, pickups, amps, cabinets and accessories such as the MiniMix II and ISO Line Out box, it was natural for us to further strengthen the entire signal path by developing a new line of pedals that will work superbly with our gear or with other manufacturers' products. Nearly two years in development, a lot of thought and time went into these pedals that will not only improve the overall sound of your rig, but provide added functionality and robust build quality that will provide many years of rock-solid performance under the most demanding playing environments. Based on our Award Winning Shiba Drive pedal. Modified existing circuits to create a unique tonal palette. Incorporates our most popular customer feature requests. New Look - Housed in a unique, spiral faced enclosure, anodized in a deep saturated color, and accented with futuristic, translucent, control knobs. 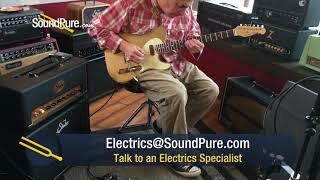 In this video, Sound Pure electrics specialist Eddie Berman tests a used, throaty beast: a used Suhr Modern Trans Blue Denim/Slate Guitar. In this video, Sound Pure guitar specialist Eddie Berman gives us a quick taste of this hard rockin' Suhr Ian Thornley Signature Seafoam Green Electric. 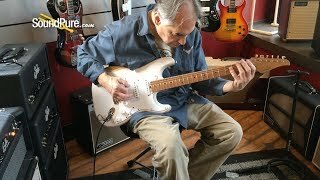 In this video, Sound Pure electric guitar specialist Eddie Berman demonstrates the tones of the Carr Telstar amp both clean and dirty using a Suhr Custom Classic Antique T and a Suhr Shiba Reloaded Overdrive Guitar Pedal. 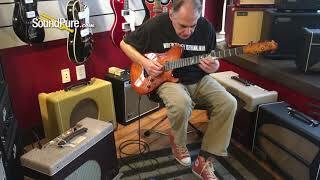 In this video, Sound Pure electric guitar specialist Eddie Berman plays the Suhr Custom Classic T Gold Electric #JS1Q6P through a Suhr Bella Reverb Head and a Suhr Bella 1x12 Cabinet with a Suhr Shiba Reloaded Overdrive Guitar Pedal and a Strymon El Capistan dTape Delay Effect Pedal. 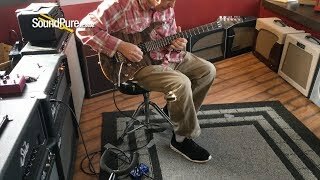 In this video, Sound Pure electric guitar specialist Eddie Berman plays the Anderson T Icon Black In-Distress Electric #07-01-18A through a 3rd Power Wooly Coats Extra Spanky Combo Amp with a Suhr Shiba Reloaded Overdrive Guitar Pedal and a Strymon El Capistan dTape Delay Effect Pedal. In this video, Sound Pure electric guitar specialist Eddie Berman plays the Suhr Mateus Asato Signature Classic S Black HSS through a Suhr Bella Reverb Head with a Suhr Shiba Reloaded Overdrive Guitar Pedal and a Strymon Brigadier dBucket Delay Effect Pedal. 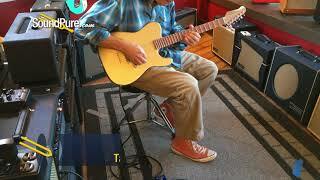 In this video, Sound Pure electric guitar specialist Eddie Berman plays the Anderson Angel Private Reserve Maple Top Electric #04-19-18A through a Suhr Bella Reverb Head and an Ace Pepper Amps 1x12 w/ ASW Speaker Cabinet using a Strymon El Capistan dTape Delay Effect Pedal and a Suhr Shiba Reloaded Overdrive Guitar Pedal. 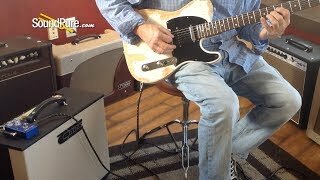 In this video, Sound Pure electric guitar specialist Eddie Berman tests out the Suhr Custom Classic Antique Trans White Heavy Aging #JS3P2U with a Suhr Bella Reverb Head (Black Tolex), a Suhr Badger 1X12 Veteran 30 Cabinet (Black), a Suhr Shiba Reloaded Overdrive Guitar Pedal, and a Strymon Brigadier dBucket Delay Effect Pedal. 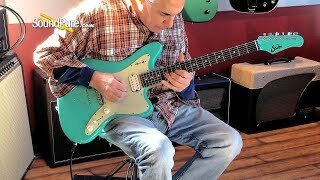 In this video, Sound Pure electric Guitar specialist Eddie Berman tries out the Moriah Guitars Tabor Model Aslan Electric Guitar. 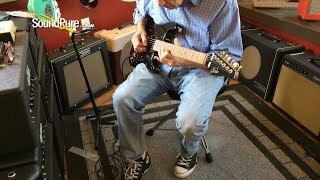 In this video, Sound Pure Electric Guitar Specialist Eddie Berman tests out the Michael Tuttle Tuned ST Shoreline Gold Electric #483 with a Suhr Badger 18 Amp Head Black (Used), a Suhr 1X12 Veteran 30 Speaker Cabinet (Black), a Strymon Brigadier dBucket Delay Effect Pedal, and a Suhr Shiba Reloaded Overdrive Guitar Pedal. 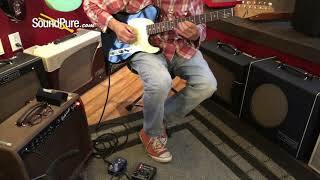 In this video, Sound Pure Electric Guitar Specialist Eddie Berman tries out the Suhr Classic T Black w/ Brian Setzer TV Jones #20318, Suhr Bella Reverb Head, Suhr Bella 1x12 Cabinet, Suhr Shiba Reloaded Overdrive Guitar Pedal, and Strymon El Capistan - dTape Delay Effect Pedal.